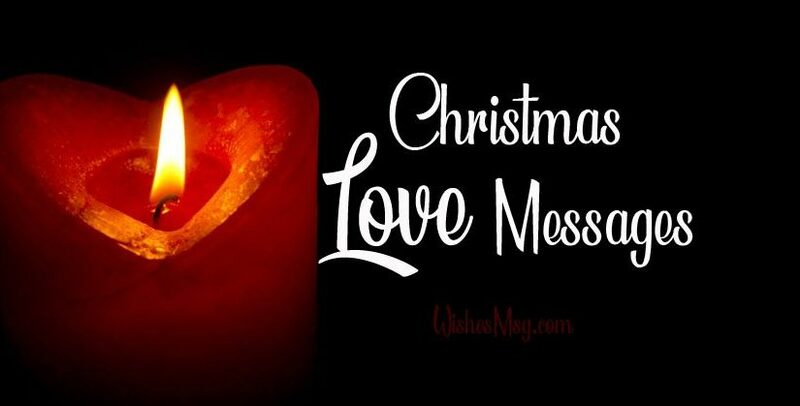 Christmas Romantic Love Messages : It’s Merry Christmas and your loved one waiting for a gift, well wishes and Christmas love messages from you. Just gifts aren’t enough to cherish your loved one, along with Gifts you should also go for sharing a sweet Merry Christmas love Messages with them. 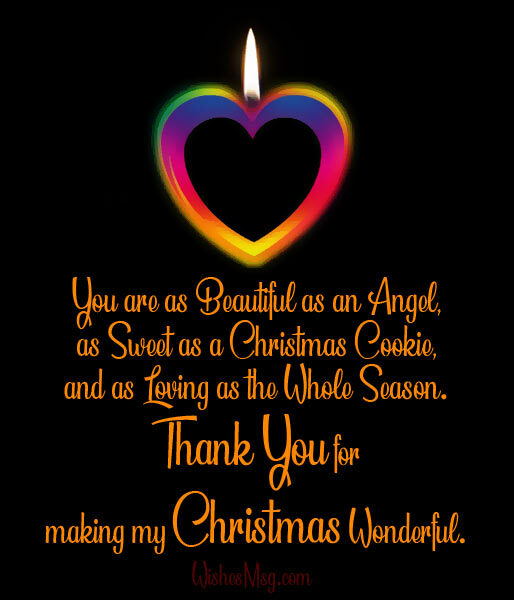 Around the web we offering most romantic Christmas love messages and wishes which are full of heartfelt feelings and able to convey your true love. 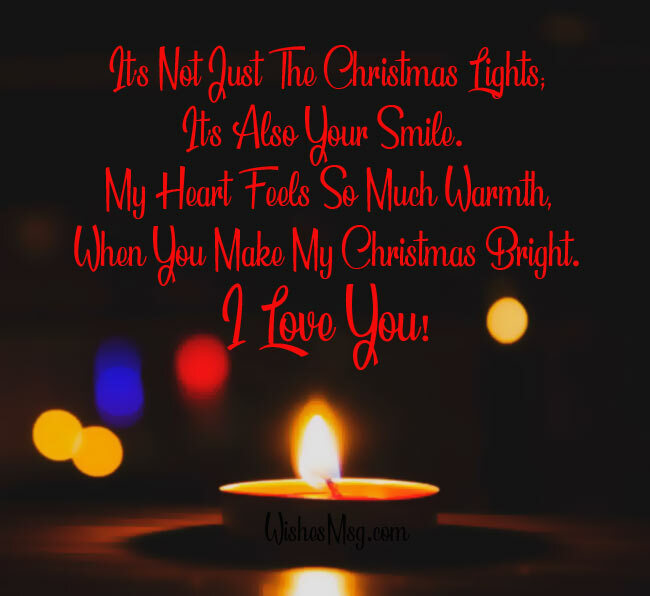 So dear, don’t be late to show your true love to your loving person who is waiting so long to get your warm wishes and romantic Christmas love messages. The best Christmas is the one when you’re with me all day and all night. Spending time with you is my wish for this season. Merry Christmas! Christmas to me is all about loving you, caring for you and making you smile all the time. I love every Christmas with you being with me. I spent my entire year thinking about how I’ll spend this Christmas with you. Finally, it’s time to make all my wishes come true. Merry Christmas! The warmth of you love melts my heart every time I think of you. Your love makes every Christmas of mine a special one! Since you have come into my life, every season has become a Christmas season for me. You’ve become the reason for my every happiness! May this Christmas bring new hopes and new dreams for our relationship. May the joys of Christmas stay with us forever! Nothing can make my Christmas evening more romantic than a text from you wishing me a merry Christmas! Thanks for the love and care! Merry Christmas! There is no better occasion to show you how much I love you other than a Christmas night. Merry Christmas my love! Tonight is for you! Your presence is the biggest blessing of all. Your smile is the biggest happiness on a Christmas! I hope you know that. Merry Christmas! Every Christmas is a special occasion for me to make love and make you laugh. This Christmas will be no exception to that. Merry Christmas! No love is truly eternal, As my love for you, My love for you is pure, My love for you is true, Here is my wish only for you, Merry Christmas to you! Wish my love stays happy forever Forever at this time, It is the time to cheer aloud, Time to find a new meaning of love, Thanks for everything sweetheart, Merry Christmas and a happy new year! I may not always say this but I truly love you and I will always love you til my last breath. I love you so much and Merry Christmas! Show lots of love this Christmas time, Show that you truly care, Because Christmas comes once a year, Which really makes it rear, So, love and spread the joy, Merry Christmas and a happy new year! When you see a falling star tonight, make a wish, it will come true because I wished and I found you. Have a Happy Christmas! The police are on the way to arrest you for stealing my heart, hijacking my feelings, and driving me crazy. See you in court! Merry Christmas dear! I wish dreams were like wishes, and wishes came true, cause in my dreams I’m always with you. have a joyful Christmas dear! If I had to choose whether to breathe or to love you, I would use my last breath to tell you that… I love you. Merry Christmas and a happy new year! On Christmas surely I’ll wrap my arms around you, holding you near begging you to stay with me, although my heart follows you everywhere. Happy Christmas! If I could be anything I would be your tear, so I could be born in your eye, live down your cheek and die on your lips. Merry Christmas darling! Everyone says you only fall in love once but that’s not true, every time I hear your voice I fall in love all over again. Happy Christmas! Smile this Christmas, Because it’s the season of love, So spread the joy around, The passion of love that surrounds, Makes my life complete, Merry Christmas and a happy new year to you! Can you take me away and never let me go back? Can you hold me in your arms and promise everything will be ok? Can you kiss my lips and make all my problems disappear? Can you love me as much as I love you? 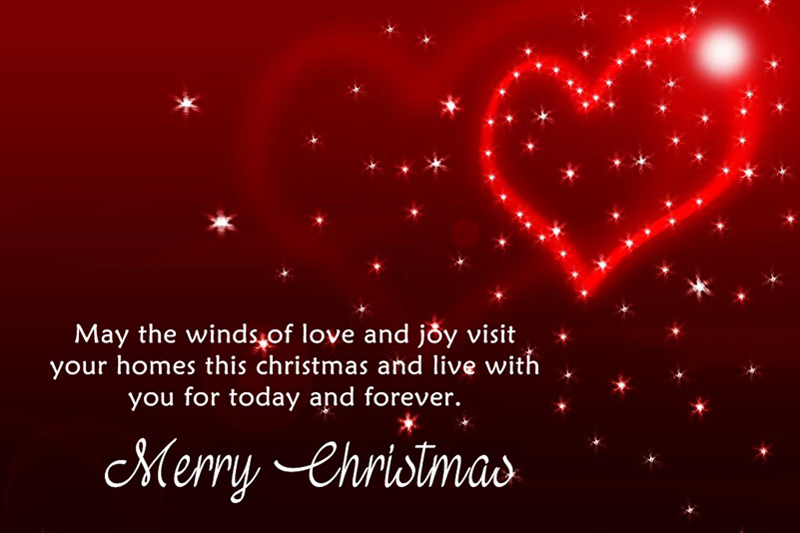 May the winds of love and joy visit your homes this Christmas and live with you and your family for today and forever. Wishing you and your family a Merry Christmas and a Happy New Year. People say that magic is fake, wishes don’t come true, and that Prince Charming is nowhere… so then how do I have you? For the world you may be the one persons, But to one person you are the world, I thank God for blessing me with the person as wonderful as u. Merry Christmas. Thank you for coming in my life, Thanks for making every moment worthwhile, Your love gives me the power, To face anything in life, Merry Christmas my dear, Stay blessed forever in time! Christmas is the festival of love and sacrifice and when it is celebrated with you it becomes a wonderful occasion of blessings showered on me Love you so much, Merry Christmas! The light in your soul brings harmony in my heart our love comes alive flourishing moments of joy my tender Christmas wishes to you! If there was a card which said the right words, I would have bought it but there wasn’t, that’s why I’m writing this… I Love You and wishing you a joyful Christmas! Snowflakes are falling. Beautiful music resonates through the Christmas atmosphere. We celebrate our true love looking by looking into the future with hope. Your charming smile unlocks the door of my heart, your gentle touch opens the window of my soul, filling me with Christmas bliss making distance disappear! The occasion of Christmas doubles up my joy, Because I have you for the company, So I can enjoy the love and the divinity, Your presence makes all the difference in life, Merry Christmas and a happy new year! Look around you, the season of Christmas is the most romantic season of all. I want to cuddle with you in one blanket, sit in front of the fiery furnace, watch the Christmas tree and listen to Christmas carols all day long. Merry Christmas to you my love. 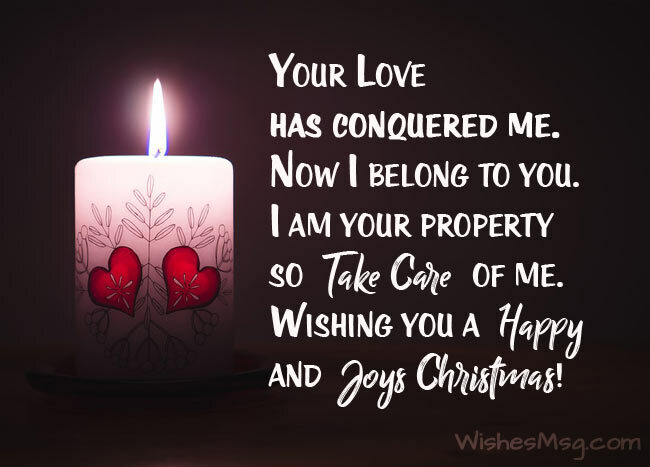 On this Christmas, share your love as much as you can to make happy your loving person and our compilation of Christmas love messages will give you full support to carry forward your love, Thank you and Merry Christmas!